In case you didn't already know it, August 10th is both National S'more Day andNational Banana Split Day. 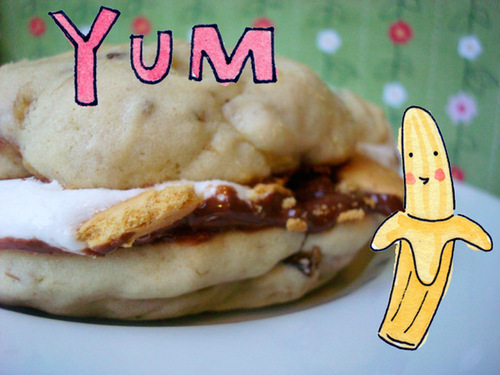 And in celebration of this momentous day, here's a dessert mash-up which allows you to go above and beyond your civic pastry eating duty: the Banana Split S'more Whoopie Pie. It combines all of the key flavor points of both the banana split and s'mores, but the delivery is a bit of a curveball: cakey banana-marshmallow cookies are lined with chocolate before sandwiching ice cream flecked with graham cracker bits. Just more proof that if some is good, s'more is better. Note: Don't like the idea of cold cookies? For an easy variation, sandwich toasted marshmallows or marshmallow fluff between the sandwiches instead of ice cream for a treat that doesn't have to be chilled.